Kumarakom, also known as the land of lakes, lagoons and backwaters is a little cluster of islands by the Vembanad Lake. 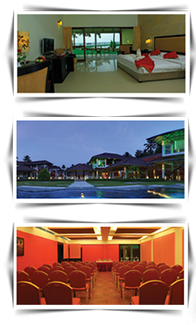 This enhancing backwater destination is 15 kms away from Kottayam and 50 kms from Cochin. With odoriferous flowers, carnival of multi coloured birds and crystal clear water this land is a 'must visit destination' recommended by National Geographic Channel. Kumarakom Bird Sanctuary is a renowned bird sanctuary where many species of migratory birds drop in. Located on 3 acres of beautifully landscape ground, backwater ripples offers spellbinding encounters with nature. Relish a psychedelic sunset on montages of clouds. Or the flying flurry of evening birds or loosen up and enjoy the cool afternoon breeze. Store under the canopy of coconut trees, sipping tender coconut water, enjoy an afternoon nap on the tree lined lawns, or snap up the ever- changing scenes on the back waters that surround you at this enhancing slice of heaven. All rooms are air conditioned and have Cable TV with satellite channels, internet access, hair dryer, tea /coffee making facilities, Refrigerator, Telephone and Mini bar on request. Gym - Our gymnasium features modern workout equipments. With the aqua sports centre, you get to splash through waves as it flaunts the latest water scoopers and high speed power box.